Meanwhile, the “Gramophone” finds different, even antithetical, reasons from my colleague for finding fault with these interpretations. Far from asserting that “emotional temperature is cool”, its critic maintains that there is “a strong sense of individuality and strength in Kotova’s playing but this is still manifest more as a desire to control the music than to allow it to control without a surrender of integrity.” Her playing is “inconsistent” and “too angry to be musically generous”. The implication here is that this feistiness is especially unbecoming in a woman cellist and that her aggression prevents the emergence of subtleties and nuances. For others, the vigour and energy of her playing prove its main attraction. 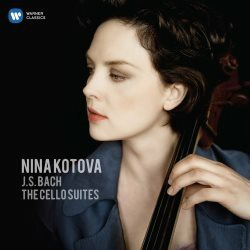 Even some positive reviews smack of gender politics – “Strong recording by a strong woman” (WAZ) – and while it is true that few women cellists have recorded these suites since Jacqueline du Pré, there must be more to say about the quality of her playing than to attribute its impact to feminism. Interestingly, she is playing the very 1673 Stradivarius once owned by her famous female predecessor and its tone is sumptuous in her hands. Even the technical characteristics of the recording prove divisive. Some love its forensic clarity, others talk of its warmth and presence, others complain of its “unhelpful proximity and brightness of the recording … so extreme that every subtlety that is missed is amplified.” Tim Perry tells us that “[h]eard over speakers it fills the room with a warm and immediate presence. Heard over earphones the perspective is flattened and a little close”; I suggest that such a contradiction tells us more about the equipment the recording is being heard upon than its intrinsic nature. It certainly sounds superb, if indeed very close and immediate, on both my Sennheiser and Bose headphones but to me equally impressive over speakers. All of which goes to illustrate how arbitrary and personal our reactions to different interpretations of great music and recording engineering can be, and to what degree critics and reviewers bring their own prejudices and preconceptions to the table. I am not exempt from that phenomenon but can only tell it as I hear it. I admit to being deeply impressed by Kotova's playing. I have half a dozen other recordings all of which can make their claim to be my preferred version; my catholic taste extends to Casals, Fournier, Starker, Tortelier and Rostropovich. I did not care for Stephen Isserlis and no longer own that set; otherwise I find that this miraculous music can withstand a wide gamut of aesthetic stances and Kotova’s account happily joins them on my shelves as another valid way of delivering it. First, her sound is big and warm and both technique and intonation are flawless. It's better than, Rostropovich, profound as his recording in Vézelay is. She negotiates the intervals in the tricky descending passage of the Prelude in No. 4 better than he. She favours a broad legato and creates an extraordinarily rich, burring tone, such as in the frenetic double-stopped passages in the Prelude to No. 3. Her choice of tempi is moderate; overall she falls somewhere in between the luxuriance of Rostropovich, who takes, 148 minutes, and the lean incisiveness of Starker, who comes in at a mere 112. There is often a wonderful singing intensity to her sound. This is amplified by the resonance of the acoustic despite the proximity of the microphone, such that you can hear her intake of breath before phrasing, like a singer – and her cello does sing. Sometimes she is as fast as Starker and Fournier, as in the Prelude to No.2, followed by a very fast Courante. Yet she can also play as languorously as Rostropovich, as in the ensuing Sarabande. Starker’s and Kotova's timings match exactly in the sombre Sarabande of No.5, yet her gutsier tone, so much earthier than the refined, aristocratic Fournier, is very apparent in the sunlit serenity of the Sarabande of No. 6. In short, she goes her own way. What matters is that a rapt, concentrated ambience should be generated, and for me she succeeds. Atmosphere is enhanced by the fact that despite the close recording there is a faint, lingering resonance built into the acoustic. Despite several seconds having elapsed, at the end of the Allemande of No.1 the tonic is still echoing as she begins to bow the start of the Courante an octave higher. Oddly, no precise recording date is provided but I am assuming it was recorded in 2014. The booklet notes are brief and unspecific.